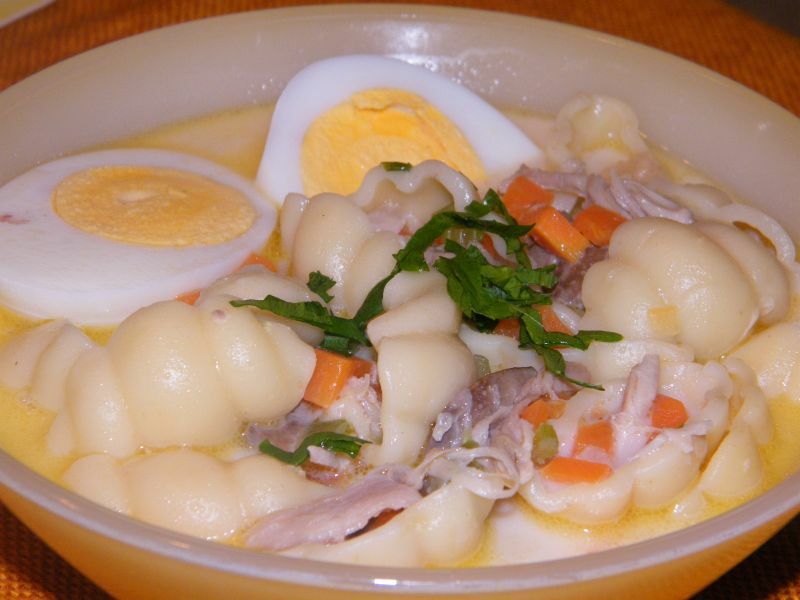 Chicken Macaroni soup, also called Chicken Sopas, is a hearty soup with chicken, elbow macaroni, and milk as its primary ingredients. We used to always have this at home on Christmas eve. My Nanay would cook a big pot of chicken sopas which we can come back to every now and then when we get hungry from all the excitement and activities leading up to Noche Buena. I can't help but feel warmth and Christmassy goodness whenever I have Chicken Sopas. This dish calls for elbow macaroni, but in this instance my wife opted for gnocchi (clam-shaped pasta) instead. And we also added button mushroom and chicken liver simply because we have some on hand; these are entirely optional of course. 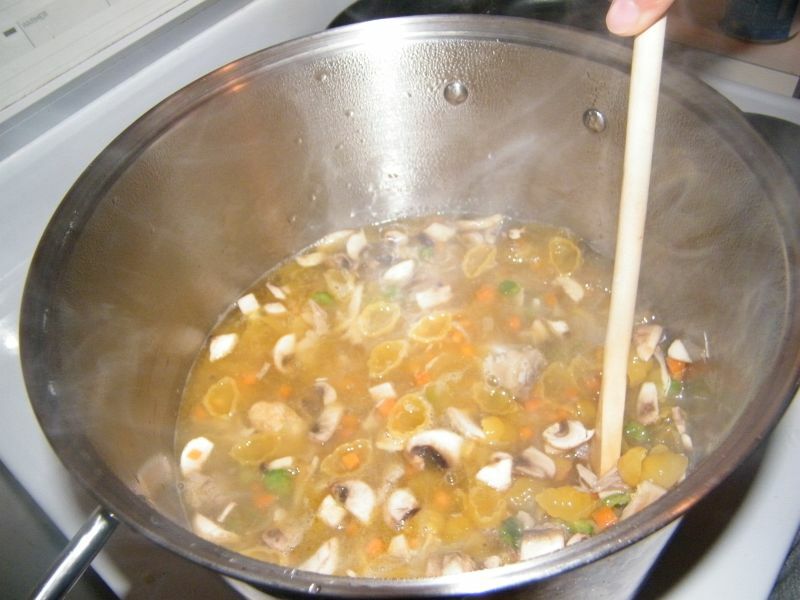 Boil the chicken in water til tender (meat is easily removed from bone). Set aside the broth. Shred the meat and set aside. Heat up cooking oil in a pan (or you may do this straight in the pot!) 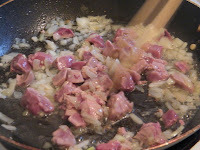 and saute onion and garlic. 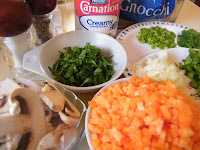 (At this stage add also the optional ingredients: chicken liver and mushrooms. Cook the liver then move to the next step). Add the shredded chicken meat. After a couple of minutes, add the carrots and celery. Season with salt and pepper. At this stage, you might want to transfer your cooking in a pot if you were cooking on a frying pan. 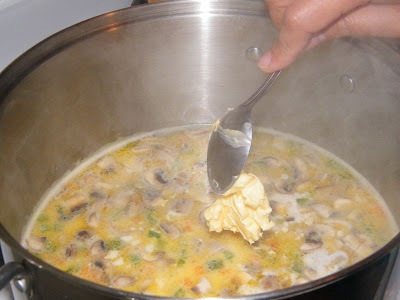 After a couple of minutes, add the elbow macaroni (in our case, the clam-shaped ones), followed by the broth, then add 5 cups water. If the water level does not sufficiently submerge the pasta and other ingredients, add more water. Simmer. Check the cooking time of the pasta indicated in its package. The minimum time is usually ten minutes. In this case, let the mixture cook for 10 minutes for the pasta to become al dente. Add the milk and stir. Then add the butter. Adjust the taste with patis and pepper. Garnish with some hard boiled egg slices and some chopped spring onions. Serve hot. Perfect for a rainy afternoon!